One of the mandarin schools in China recognized by National Hanban and the Confucius Institute Headquarters, also recognized as a Registered HSK Chinese Proficiency Test Centre. We have been teaching Mandarin for more than eight years, we have taught more than 6,000 expatriate students and provided over 2,000 of our Chinese language teachers to various educational institutions all over the world. A wide range of programs for 16 levels of Chinese, small group classes, private tutoring, business specialized Chinese, Chinese Culture, HSK exam preparation, Chinese teacher training, internship and junior summer programs to help with Learning Chinese. We ensure our chinese language teachers are nurtured via the professinal training and evaluation system which also guarantees long-term teaching quality and a positive attitude among our teachers. Qualified and experienced teachers who are bilingual, degree qualified, Teaching Chinese as Second Language Certification qualified and must have taken 200 hours of comprehensive training courses. According to your selected Chinese course, Mandarin Garden provides VIP tailor made E-learning online assisted learning courses. Free tea and snacks, Chinese culture activities once a week. Mandarin Garden provides Top-notch Customer Service, whether it be airport shuttle service, various culture activities organized weekly, customer satisfaction survey, exams, study evaluation reports or 24-hour service of daily-life guide. Mandarin Garden has started creating teaching materials of its own and providing textbooks around the world through HK Siji publisher since 2010. Mandarin Garden’s teaching and learning materials are designed according to the national test of Chinese language ability for foreigners. Moreover, those textbooks are also made for the learners who need to study language communication in real life. Mandarin Garden has been invited by Hanban to attend and present those textbooks in the Frankfurt Book Fair in 2015 and the 10th Confucius Institute Conference Resource Exhibition. 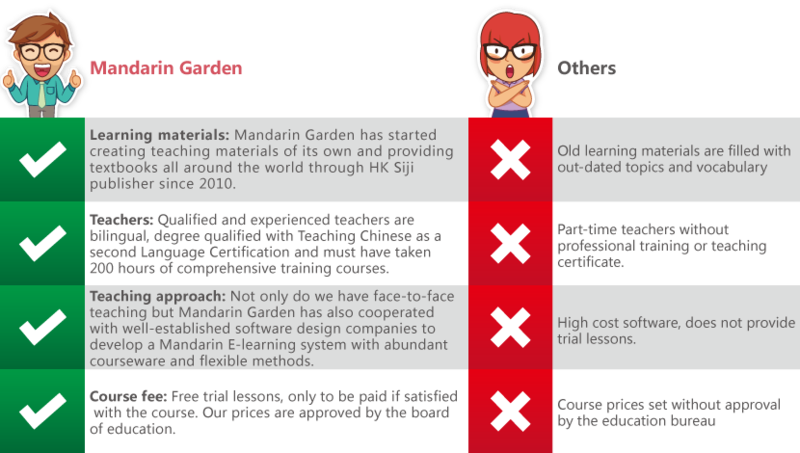 Mandarin Garden cooperated with well-known software designing companies, developed a Mandarin E-learning System with abundant courseware and flexible methods which will soon become the popular way of learning Chinese. The combining of traditional class and online class, online courses and mobile platforms (IOS, Android, IPAD) raises Chinese learning to a higher level. Chinese Anytime offers you ultimate flexibility in time and location. You can study Mandarin Garden Online Chinese whenever and wherever you want: 24 hours a day, 7 days a week. Both face-to-face courses and the E–learning courses follow the same guidelines and format. We are not only providing professional Chinese courses, but also have a perfect after-sale service system and team. We have a professional service team to solve the preliminary course arrangement, accommodation service, airport transportation service, visa service and other value-added Services for you. We always endeavor our service principle of “wow service”, striving to offer the perfect service beyond your imagination, and make sure that your Chinese learning at Mandarin Garden will be worry-free. “Ruhong Academy” is a prestigious cultural and social etiquette academy which provides the ideal meeting place for Chinese art, culture masters and senior teachers and students. It focuses on Chinese classics, language, culture, art and social etiquette learning. “The cross culture social etiquette master's program” offered by the Ruhong Academy is a major breakthrough in terms of talent building at Mandarin Garden Education. Our goal is to nurture the much needed international talents and senior professionals who are not only bilingual but bi-cultural with integrated management capabilities as well as cross cultural sensibility and social adaptability.